We hypothesized that wounds responsive to treatment with hyperbaric oxygen (HBO) will increase cellular accumulation of the oxidative free radical marker 3-nitrotyrosine (3-NT). We examined this hypothesis by measuring the accumulation of 3-NT in cells collected non-invasively from wounds of 12 diabetic patients with chronic non-healing foot wounds treated with HBO. Immunocytochemistry using a 3-NT specific antibody in conjunction with flow cytometry was used to measure cellular accumulation of 3-NT. Only epithelial cells were collected from the six patients showing progressive healing, whereas in the six patients showing minimal improvement, both neutrophils and epithelial cells were found. Progressively healing patients had a three-fold greater epithelial cell accumulation of 3-NT compared to patients showing minimal improvement (p<0.001). Progressively healing patients' mean epithelial 3-NT accumulation was at or near zero at the start of HBO, increased for the first two weeks, remained constant during weeks two through four, and then declined by week five. In patients showing minimal improvement, epithelial cell accumulation of 3-NT remained unchanged by treatment. This data supports the hypothesis that HBO increases oxidative radical production early in the healing process and that this increase is associated with favorable treatment outcome. The presence of neutrophils is predictive of unfavorable outcome. These findings suggest that non-invasive wound sampling can be used to objectively determine if a wound is responding favorably to treatment with HBO. The medical art of healing the chronic diabetic foot wound is to a great extent empirical. Current methods rely on visual examination of the wound. For example, the appearance of granulation tissue and the formation of new epithelium are often noted as signs of positive treatment effect, whereas increasing size of a wound may indicate treatment failure. Since changes in the chronic wound may occur over a period of several weeks, determining the effect of treatment can be problematic. Extensive documentation, including photographs, can contribute to the objectivity to this process. However, extensive documentation adds to the time and cost of treatment and may not be feasible in many healthcare models. Wound treatments, including amputation, topical growth factors, and hyperbaric oxygen (HBO), are also expensive. Finally and most importantly, time and effort spent on ineffective treatment is time lost to the patient and perhaps a window of opportunity lost to the physician if the wound progresses and amputation is the only remaining treatment option. When these aspects of wound treatment and evaluation are considered, diagnostic methods that rapidly and objectively determine the effect of wound treatment are of considerable economic and therapeutic importance. Our main hypothesis is that treatments that are effective will increase the production of nitric oxide (NO) in the chronic non-healing wound. In addition, increased production is an early event that could serve as a rapid indicator of treatment effect. In other words, effective treatments will cause increased NO production, whereas treatments that have little effect will not increase NO. There is significant evidence suggesting that NO plays an important role in healing of the chronic wound. NO is produced by a variety of cells including wound resident macrophages, epithelial cells, and neutrophils. NO promotes angiogenesis, keratinocyte proliferation, and collagen deposition[4-6] -- properties that are essential to wound repair. When other radicals such as superoxide are present, NO reacts to form an especially toxic radical, peroxynitrite, which is thought to be important in the reduction of bacterial colonization. [7-9] NO has a half-life that is measured in seconds. However, stable end products of NO including nitrate and 3-nitrotyrosine (3-NT) have been used as an indirect measure of NO production. The correlation between healing and increased NO production has been demonstrated in the non-healing diabetic wound. Non-healing diabetic wound exudate fluid nitrate levels have been shown to be decreased relative to wound exudate from surgical wounds of normal subjects, suggesting that NO production is deficient in diabetic patients. In a recent report, we have shown that when non-healing diabetic foot wounds are treated with topical platelet-derived growth factor (PDGF)*, urine nitrate levels are two-fold lower (P<0.01) for patients whose wounds still fail to heal compared to those whose wounds respond and heal. Plasma levels show a similar relationship with a four-fold difference on average, though this difference was not found to be statistically significant due to inter-patient variance. These data show that increased NO production is correlated with wound healing and a favorable treatment outcome with topical PDGF. Taken together, these results suggest that nitrate determination could be used to objectively evaluate the clinical response of the diabetic wound to treatment. However, systemic nitrate levels are problematic, since substantial amounts of NO and consequently nitrate are produced during maintenance of vascular homeostasis and during disease processes characterized by inflammation. Thus, systemic nitrate levels may be elevated in some patients despite the absence of healing. In addition, non-invasive sampling of wound exudate and subsequent determination of nitrate can be problematic if the wound produces little exudate. Another end product of NO production, 3-NT, was therefore considered as a healing marker. 3-NT is produced in situ by the reaction of nitrating agents and free or protein-associated tyrosine. Peroxynitrate is produced by the reaction of NO and superoxide, though other chemistries have also been identified. The non-healing diabetic wound is composed of macrophages and other immune effector cells that are inactive but have the capacity to produce peroxynitrite. We hypothesized that an early event in healing is increased NO and consequently peroxynitrite and, as a result, increased cellular accumulation of 3-NT. In an earlier report, we demonstrated that 3-NT accumulation occurs in the activated murine macrophage-like cell line and that cellular accumulation can be measured using immunocytochemical methods in conjunction with flow cytometry. These previous findings suggested to us that cellular accumulation of 3-NT in cells collected from the wound could be used as an objective marker of healing during treatment with HBO. Diabetic patients with non-healing wounds that had failed antibiotic therapy and met the criteria for treatment with HBO were enrolled in the study. Further, only those patients with whom the objective of treatment was wound healing were selected. In some cases, HBO therapy is given to define viable tissue prior to amputation. Thus, in these cases healing is not the objective of therapy. In this study, subjects meeting these criteria were selected consecutively until a total of 12 patients were acquired. One patient who was initially included was later excluded because he failed to return for treatments after initial evaluation. Patients inspired 100 percent oxygen for 90 minutes with five minute intervals of air every 30 minutes at a pressure of 2.4 atmospheres absolute once a day until their wound showed significant signs of healing or until treatment was determined to be ineffectual. A favorable outcome was determined by observing the formation of granulation tissue and reepithelialization of the wound bed, called herein progressive healing (PH), whereas those patients that showed little or no improvement during treatment are called herein minimal improvement (MI). Transcutaneous oximetry (Tcom) values were obtained on all patients prior to initiation of their HBO treatment series. Several Tcom units** are currently used to gather this baseline data on all patients for our facility database. These values are obtained in the standard fashion after the skin sites are prepared by shaving, cleansing, and dabbing with adhesive tape. The monitor leads are attached after the ionic Tcom solution is placed in the membrane/ring electrode. The chest was used as the site for control values and the other values were obtained from skin near the wound. Wound dressings were collected during wound care. Portions containing exudate were cut from the dressing and placed in 25ml of Dulbecco's phosphate buffered saline (DPBS) with a pH of 7.4, shaken for three minutes, and then centrifuged. The supernatant was aspirated, and then the pellet was suspended in 10ml DPBS. The cell suspension was then filtered through a 60µm nylon mesh to remove threads and other large debris. The filtered suspension was centrifuged, the supernatant was aspirated, and the pellet was suspended in fixative***. Fixed wound exudate cells were washed twice in 10ml DPBS and then blocked for non-specific binding of secondary antibody for 30 minutes with ten percent normal goat serum. Cells were then suspended in 10µl of rabbit polyclonal IgG anti-3-NT antibody solution†, diluted 20-fold in DPBS in ten percent normal goat serum, and incubated overnight in the dark at 4_C. Cells were then washed two times with 1ml DPBS and suspended in 10µl of phycoerythrin-conjugated goat anti-rabbit Fab fragment solution††, diluted 20-fold in DPBS, and then incubated for one hour at room temperature. Following incubation, the cells were suspended in 400µl DPBS. Processing for the 3-NT negative control was identical to the above with the exception that IgG collected from normal rabbit serum‡ was used instead of anti-3-NT IgG antibody. The concentration of rabbit IgG in the negative control was identical to anti-3-NT antibody. Flow cytometry was performed on a flow cytometry instrument‡‡. The epithelial and PMN cells that we sought were separated from exudate debris using a dot-plot of linear side scatter and linear forward scatter of light, which corresponded respectively to the size and roughness fingerprint of these known standard cell types. The identity of cells was confirmed by sorting the gated population and evaluating morphology using conventional light microscopy. The fluorescence intensity associated with phycoerythrin was measured using the peak height measured for each cell in the FL-2 band pass filter. The same instrument settings were used during all runs reported. The geometric mean of the population of FL-2 signals was computed using Cell Quest software (Becton-Dickinson) and used in subsequent statistical comparisons. A minimum of 10,000 cells was used for population statistics. Of the 12 patients considered in this study, six showed PH and six showed MI during treatment with HBO. Table 1 shows that demographic characteristics of PH and MI patients are similar. The table also shows that in all MI patients, neutrophils were recovered from the wound sample, whereas none were recovered from PH patients. 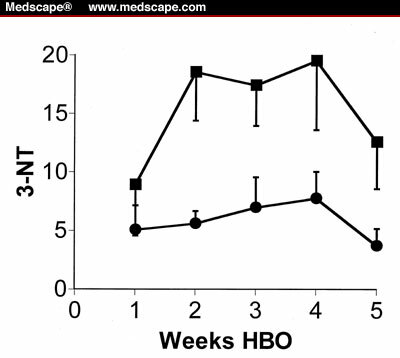 Our main hypothesis is that HBO increases the production of oxidative radicals and that this increase is essential for healing and will be revealed by increased cellular accumulation of 3-NT in healing wounds compared to non-healing wounds. In addition, we have postulated that production of oxidative radicals is a relatively early event in the healing process, thus cellular accumulation will decline in the later stages of healing. In contrast, MI patients are expected to show no change in cellular accumulation of 3-NT during treatment with HBO. Figure 1 shows that the data collected during this study supports this hypothesis. PH and MI patients show similar levels of epithelial cell accumulation of 3-NT during the first week of HBO treatment. However, by week two, trends in accumulation diverge with PH patients showing significantly greater accumulation than MI patients. By week five, 3-NT levels decline in PH patients. 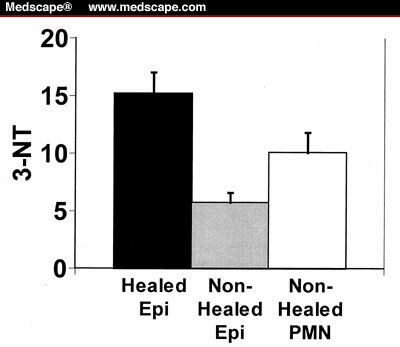 Figure 2 shows that accumulation of 3-NT in epithelial cells is approximately three times greater in PH compared to MI patients (p<0.001, Tukey-Krammer multiple comparison test). Figure 1. 3-NT in wound exudate cells in healing and non-healing patients. Black squares represent 3-NT of six PH patients during the period; black circles represent 3-NT of six MI. Error bars are SEM. Figure 2. 3-NT cellular accumulation in healing and non-healing cells. PMN polymorphonuclear cells, i.e. neutrophils. Difference between epithelial cell accumulation of 3-NT in MI and PH patients highly significant (Tukey-Kramer Honest Significant Difference test, p<0.001); other differences not significant. Another hypothesis that has been addressed during the current investigation is that patients with lower Tcoms will respond less favorably to HBO. Table 2 shows that PH and MI patients are similar with respect to Tcoms. Logistic regression of outcome versus Tcom values did not indicate a significant relationship (lowest p-value 0.41 for air breathing, chest reference location). Correlation analysis of maximum 3-NT level and Tcom parameters showed a weak positive correlation for chest reference air breathing (Pearson's correlation, p<0.08). Other 3-NT/Tcom relationships showed even less statistical significance. A non-healing wound in a patient with diabetes requires aggressive intervention to prevent the loss of a limb. HBO treatment is an approved intervention that has been shown to be effective and is sometimes used as an adjunct to antibiotics. Since the cost of HBO treatment is high, $14,000 for 30 treatments at one treatment center, diagnostic methods that reduce treatment time and cost are beneficial. We reasoned that a biomarker linked to early events during healing could be used to determine if a patient is responding to treatment or if another treatment modality should be employed. Early determination of treatment effect would result in improved resource management and improved patient care. Although patient numbers are small in this study, some clear trends are observed. Identification of neutrophils in the cell suspension obtained from the wound predicts unfavorable treatment outcome with HBO. Since neutrophils are associated with the acute response to bacterial infection, one explanation is that antibiotic therapy was insufficient and that normal healing could therefore not proceed. HBO has been shown to selectively inhibit neutrophil adhesion in healthy subjects, thus another possible explanation is that in these diabetic subjects, neutrophil response was inappropriate leading ultimately to wound failure. Both explanations deserve additional investigation. 3-NT accumulation in epithelial cells is increased in PH patients but not in MI patients during treatment with HBO. This supports our primary hypothesis that increased oxygen partial pressure in the wound will lead to increased production of oxidative radicals such as peroxynitrite that in turn nitrate proteins, including those found in epithelial cells. In all PH patients, epithelial cell accumulation of 3-NT was near zero at the beginning of HBO treatment and then increased by at least three-fold during the next several weeks. We did not find any relationship between Tcom values and wound healing outcome or 3-NT accumulation suggesting that oxygen increase above some threshold is sufficient to cause increased production of nitrating radicals and also healing. These findings suggest that changes in epithelial cell accumulation of 3-NT could be used to determine if patients are responding to HBO treatment. Patients that fail to show an increase in 3-NT during the first two weeks of treatment should receive another treatment besides HBO. The chemical kinetics governing the accumulation of 3-NT in wound exudate cells are unknown. Both epithelial cells and neutrophils are capable of producing nitrating species. However, the processes governing the accumulation of nitro adducts, including 3-NT, in cells are only poorly understood. Recently, denitrase-like activity has been identified in some organs, and hypochlorous acid produced by neutrophils may cause the removal of the nitro group from 3-NT. There is evidence that HBO inhibits transcription of inducible nitric oxide synthase gene in murine peritoneal macrophages suggesting indirectly that HBO may inhibit formation of nitrating species. Clearly, more research is required to definitively identify the mechanisms that govern 3-NT accumulation. Cellular accumulation occurs when the rate at which adducts are formed exceeds the rate at which they are removed. We have hypothesized that in the healing wound, production of nitric oxide increases leading to increased nitrating species and increased nitro adduct formation. Given our current understanding of the chronic non-healing diabetic wound, it appears that increased oxygen partial pressure can facilitate increased nitric oxide synthesis rate and in turn increase healing rate. ‡ Upstate Biotechnology, Lake Placid, NY. Beckman JS, Koppenol WH. Nitric oxide, superoxide, and peroxynitrite: The good, the bad, and ugly. Am J Physiol 1996;271(5 Pt 1):C1424-37. Goligorsky MS, Budzikowski AS, Tsukahara H, Noiri R. Cooperation between endothelin and nitric oxide in promoting endothelial cell migration and angiogenesis. Clin Exp Pharmacol Physiol 1999;26(3):269-71. Benrath J, Zimmermann M, Gillardon F. Substance P and nitric oxide mediate wound healing of ultraviolet photodamaged rat skin: Evidence for an effect of nitric oxide on keratinocyte proliferation. Neurosci Lett 1995;200(1):17-20. Schaffer MR, et al. Inhibition of nitric oxide synthesis in wounds: Pharmacology and effect on accumulation of collagen in wounds in mice. Eur J Surg 1999;165(3):262-7. Thornton FJ, Schaffer MR, Witte MB, et al. Enhanced collagen accumulation following direct transfection of the inducible nitric oxide synthase gene in cutaneous wounds. Biochem Biophys Res Commun 1998;246(3):654-9. Schaffer MR, Efron PA, Thornton FJ, et al. Nitric oxide, an autocrine regulator of wound fibroblast synthetic function. J Immunol 1997;158(5):2375-81. Hurst JK, Lymar SV. Toxicity of peroxynitrite and related reactive nitrogen species toward Escherichia coli. Chem Res Toxicol 1997;10(7):802-10. Zhu L, Gunn C, Beckman J. Bactericidal activity of peroxynitrite. Arch Bioch and Biophysics 1992;298:452-7. Evans TJ, Buttery L, Carpenter A, et al. Cytokine-treated human neutrophils contain inducible nitric oxide synthase that produces nitration of ingested bacteria. Proc Natl Acad Sci USA 1996;93(18):9553-8. Schaffer MR, Tantry U, Efron P, et al. Diabetes-impaired healing and reduced wound nitric oxide synthesis: A possible pathophysiologic correlation. Surgery 1997;121(5):513-9. Boykin JV, Kalns JE, Shawler LG, et al. Diabetes-impaired wound healing predicted by urinary nitrate assay. WOUNDS 1999;11(3):62-9. Eiserich JP, Hristova M, Cross C, et al. Formation of nitric oxide-derived inflammatory oxidants by myeloperoxidase in neutrophils. Nature 1998;391(6665):393-7. Loots MA, et al. Differences in cellular infiltrate and extracellular matrix of chronic diabetic and venous ulcers versus acute wounds. J Invest Dermatol 1998;111(5):850-7. Kalns J, Parker J, Bruno J, et al. Nitrate reductase alters 3-nitrotyrosine accumulation and cell cycle progression in LPS + IFN-gamma-stimulated RAW 264.7 cells. Nitric Oxide 1998;2(5):366-74. Caputo GM, Cavanagh PR, Ulbrecht JS, et al. Assessment and management of foot disease in patients with diabetes. N Engl J Med 1994;331:854-60. Zamboni WA, et al. Evaluation of hyperbaric oxygen for diabetic wounds: A prospective study. Undersea Hyperb Med 1997;24(3):175-9. Doctor N, Pandya S, Supe A. Hyperbaric oxygen therapy in diabetic foot. J Postgrad Med 1992;38(3):112-4. 18. Ciaravino ME, Friedell ML, Kammerlocher TC. Is hyperbaric oxygen a useful adjunct in the management of problem lower extremity wounds? Ann Vasc Surg 1996;10(6):558-62. Thom SR, Mendiguren I, Hardy K, et al. Inhibition of human neutrophil beta2-integrin-dependent adherence by hyperbaric O2. Am J Physiol 1997;272:C770-7. Kamisaki Y, Wada K, Bian K, et al. An activity in rat tissues that modifies nitrotyrosine-containing proteins. Proc Natl Acad Sci USA 1998;95(20):11584-9. Whiteman M, Halliwell B. Loss of 3-nitrotyrosine on exposure to hypochlorous acid: Implications for the use of 3-nitrotyrosine as a bio-marker in vivo. Biochem Biophys Res Commun 1999;258(1):168-72. Zhang J, et al. Inhibition of nitric oxide synthase on brain oxygenation in anesthetized rats exposed to hyperbaric oxygen. Undersea Hyperb Med 1995;22(4):377-82.